Competing with the likes of the Bose QuietComfort 35s, Sennheiser has released its new PXC 550s into the wireless noise-cancelling arena. As well as offering a Bose-beating 30 hours of battery life and NFC pairing, the headphones also feature a touch panel for controlling the headphones. But the PXC 550's coolest feature is their ability to tell when you've taken them off your head, so no more missing a crucial moment in a song when you need to quickly take off your headphones to talk to someone. 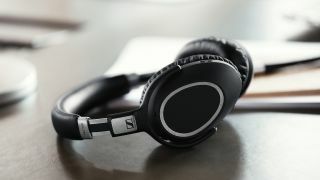 Noise-cancelling duties are handled by Sennheiser's proprietary NoiseGard technology, and its CapTune app which provides a sound equaliser for use with the headphones. The Sennheiser PXC 550 wireless noise-cancelling headphones will be available in the UK from mid-July for $399 (£329.99).